The time has come to drop those buffs and shuffle the tribes! With 15 survivors remaining, the Heroes, Healers, and Hustlers randomly draw buffs to be placed into their new tribe. The three revamped tribes have to test their new and pretty much non-existent bonds immediately with a Reward Challenge for a "peanut butter and jelly bonanza." Yawa AKA red tribe wins PB&J and bags of chips, the most budget conscious reward you can have as a group. 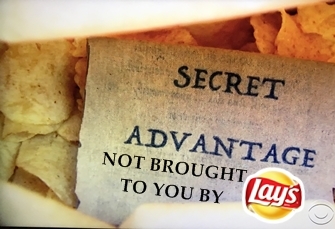 Yawa divvies up their sandwiches and individual brown bags of chips and if you're getting bagged snacks and it's not product placement, a secret advantage is ahead. Jessica discovers the secret advantage in her bag, which allows her to block one person from voting at the next Tribal Council. She shares her secret with fellow Healers Cole and Mike, which Cole proceeds to divulge to Ben and Lauren as a way to gain trust. Jessica is baffled and upset to learn the whole tribe knows her advantage because of her flirting buddy Cole, concerned she picked the wrong guy to trust. Speaking of secret advantages, Ryan reveals to new tribemate Chrissy that he gave her the secret advantage at the first Tribal Council to make sure she was safe. Chrissy smile radiates happiness and potentially a new partnership is formed. New Levu is also divided into two pairs of unlikely partners: former rivals Ashley and Alan and Healers Joe and Desi. 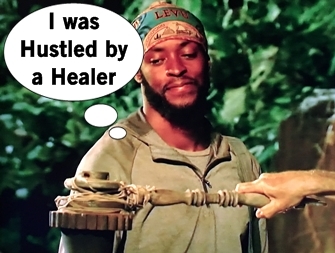 Hustler Devon sits in the clutch position of swing vote and easily picks the Heroes side after catching Joe in a super easy to fact-check lie. At the Immunity Challenge, Yawa and and Soko's puzzle smarts secure them immunity and dooms Levu to Tribal Council. Since Yawa won immunity, Jessica plans to use her anonymous vote block to help her fellow Healers. The Healers need the help they can get after Joe's plan to get the target put on himself (and shock everyone with his idol) ends up creating more of a target on Desi. Desi request that as an extension of trust, Joe should play his idol on her. Right before heading to Tribal Council, Devon find a surprise in his bag: the secret advantage! Devon hopes this could be something amazing to grab the power... oopsies. Tribal Council time! The conversation kicks off with talk about the heated afternoon discussion incited by Joe. Ashley is not pleased at being call the weakest link and Desi fears she's in trouble due to Joe's actions. Devon says he'll be voting with who he feels more comfortable moving in the game with. Alan points out the Healers are undefeated and if they are left together, they head into a future merge potentially six strong and ready to pick off the rest. 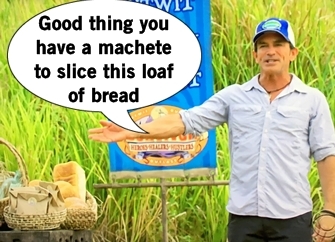 Probst announces it's time to vote and Devon reveals his secret advantage but the joy fades from his face when he reads that he's been blocked from voting. "That is not an advantage," he says glumly. The remaining four vote and when Probst prepares to read the votes, Joe gets up and plays his Hidden Immunity Idol on himself. The two votes against Joe are null and Alan is voted out of the game with the two remaining votes. Twists galore!